VMware: Fiber Channel HBA Reports Wrong WWN? 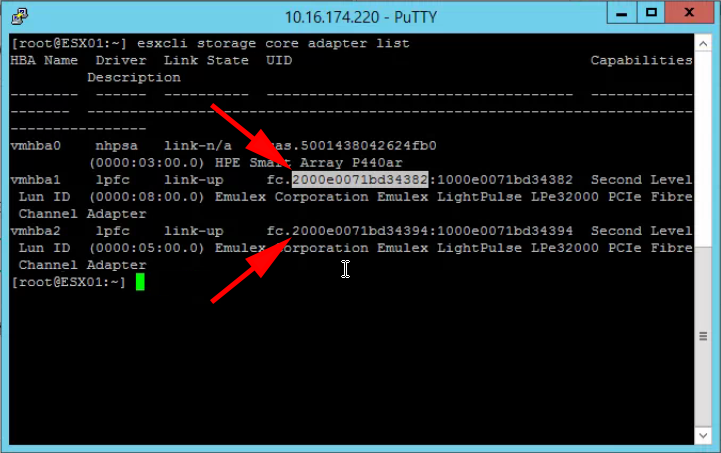 Home » ESX » VMware: Fiber Channel HBA Reports Wrong WWN? Not only is that 19 Characters long, and not 16 characters, but BOTH VMHBA’s WERE THE SAME! Like MAC addresses they should be unique? So I’m guessing this is a bug. Thankfully they were cabled into a SAN Switch which told me the correct WWN addresses. But what if we didn’t have a SAN switch? Or we had a lot of servers and needed to get all the correct WWN addresses documented? Above, you can see the 16 character WWN, between the ‘fc:’ and the second ‘:’ I’ve highlighted the WWN for vmhba1 and indicated the second one.